From his permanent move to CSKA Moscow in 2010, Sekou Jabateh Oliseh had some touching moments in the Russian top flight league. 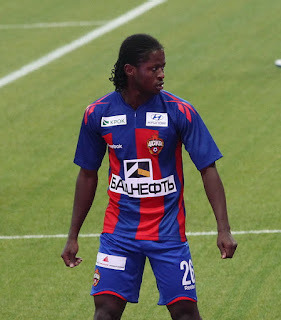 He was seen as an essential prospect for Krasno-sinie (Red-blues) boys. Even though he was not more of a goal scorer but his ability for creating chances was never overlooked. According to Wikipedia, Jabateh scored 11goals for three clubs ( CSKA Moscow, Poak and Krasnodar) during the period of five seasons. Sekou Jabateh Oliseh is currently manage by M&D sports management. Only five out of the 10 players they manage are attach to club currently, with notable Ghanaian central defender John Boye making the cut of attach players. Since June 2015 Jabateh has never feature in an official match for both club and country. According to transfer market,Jabateh market value dropped drastically from £3.42m to £360k, and this figure came this low since November 20, 2016. Currently an unattached player, Jabateh is a shadow of his former self. But where has it gone wrong? One major problem has being his management (M&D), they have a very poor performance in terms of selling out their clients, their track record can clarify that. However, his associates and his classical partying life style are the real hammers that got his career hitting the low.